1. A renowned civil engineer says more than 600 steel rods on the new Bay Bridge were made to be too hard and could be vulnerable to cracking, SFGate reports. Tests show that the rods rated at hardness levels above industry standards — just like the 32 giant bolts that already snapped. However, John Fisher, a civil engineer and bridge specialist working with Caltrans, said the agency should wait for the results of more testing before deciding to replace the 600-plus rods. Those tests also will help the agency determine whether to delay the planned Labor Day opening of the new $6.4 billion span. 2. 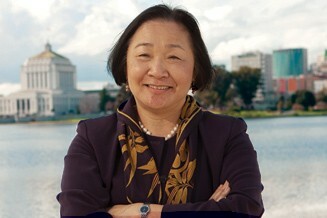 Mayor Jean Quan’s chances of being reelected improved late last week with the announcement by Oakland City Auditor Courtney Ruby that she will not challenge Quan in 2014. The Trib reported that Ruby has decided to seek reelection as city auditor and that Port Commissioner Gilda Gonzales also has ruled out a run for mayor. Councilwoman Rebecca Kaplan and county Supervisor Nate Miley have both previously said that they will not run for mayor next year. Currently, the only potential challengers for Quan are San Francisco State professor Joe Tuman, who finished fourth in the 2010 mayor’s race and has never won elective office, and Port Commissioner Bryan Parker, who has little name recognition. 3. A new study reveals that soda consumption is declining among African-American and Latino children, but that kids instead are drinking sugary fruit juices that are just as bad, KPCC radio reports (via Rough & Tumble). 4. East Bay oil refineries are increasingly importing dirty tar sands oil — or are making plans to do so — from Canada via train, as the nation awaits a decision from the Obama administration about the controversial Keystone XL pipeline, the CoCo Times reports. 5. San Joaquin Valley farmers and agribusinesses are getting more worried about the dramatic increase of fracking in California and the prospect that it will either use too much water in the state or pollute the water supply, The New York Times reports. 6. And the fate of California’s high-speed rail project is now in the hands of an obscure federal panel that will decide soon whether the state can break ground on the first portion of the $69 billion plan, McClatchy reports (via Rough & Tumble).